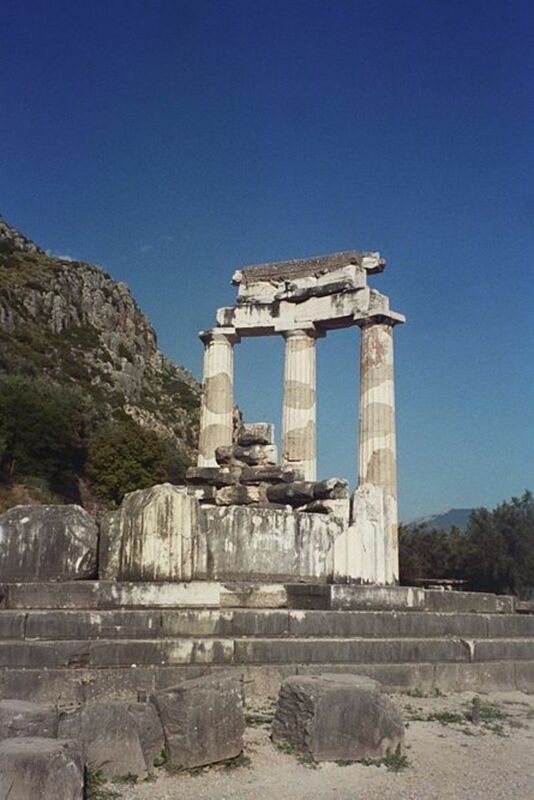 We journey now to the Temple of Apollo at Delphi, Greece, where the Delphic Oracle gave prophesies to commoner and king. 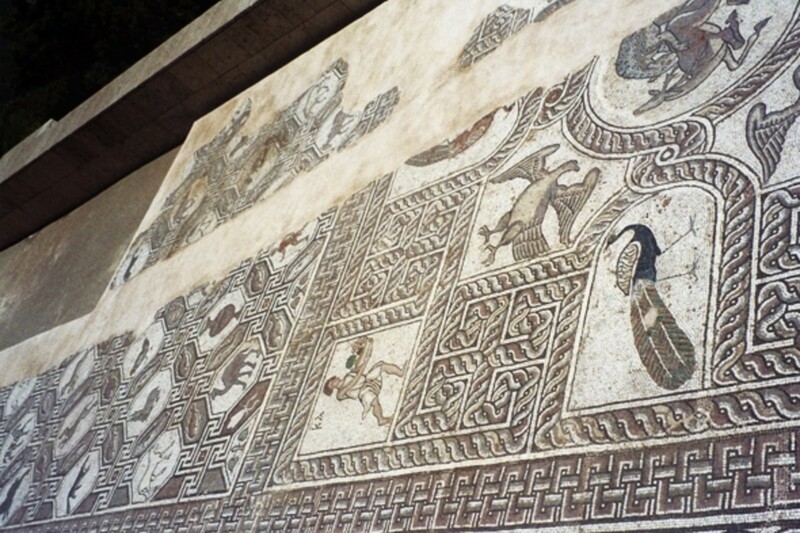 I'll share my photos, memories and knowledge of this stunning Greek site. 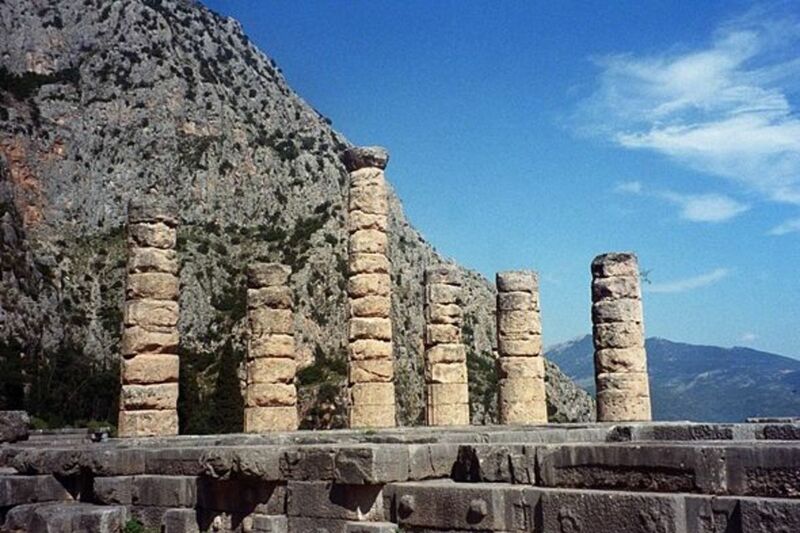 Delphi also features an unusual temple of Athena on the slopes of Mt. Parnassos below (Open Google Map in spare window). 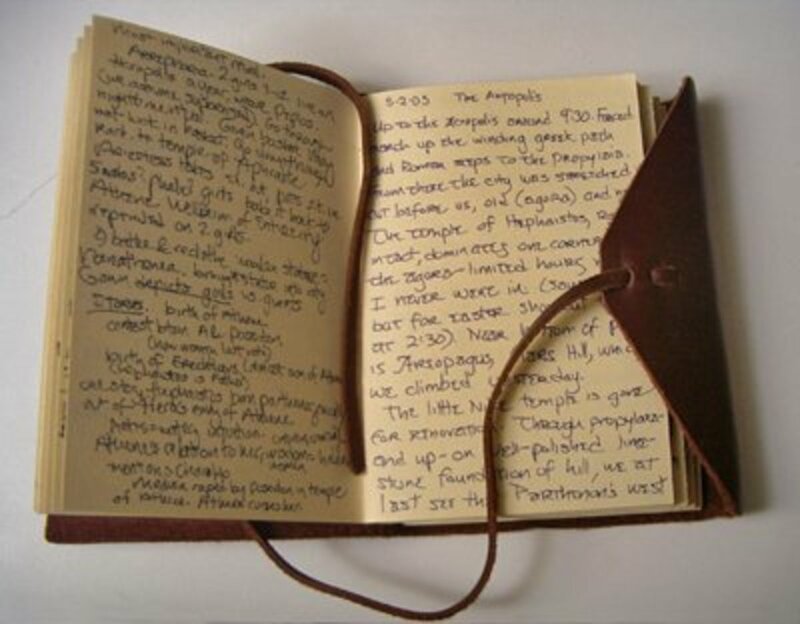 If you have just surfed in, I invite you to start at the beginning of my journey, and head back to Athens: Ancient Greece Odyssey: A Traveller's Journal. 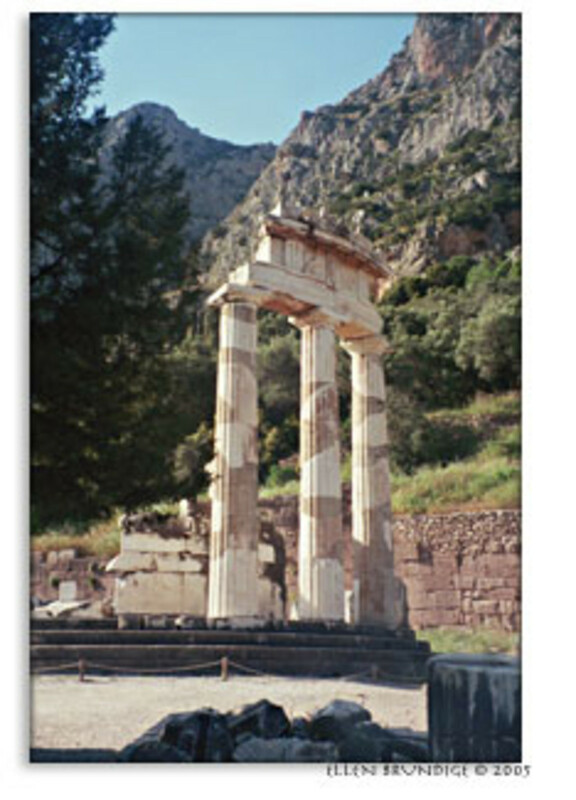 Or read on to take a tour of Delphi as I retrace my journey to Greek sites. Driving west from Eleusis and Athens, we soon climb into the mountains of Attika, past olive groves and farmland, fields of poppies, wheat, mustard, brilliant yellow Scottish broom, lilies and acacia, tall and stately dark cypress, Allepo pines. 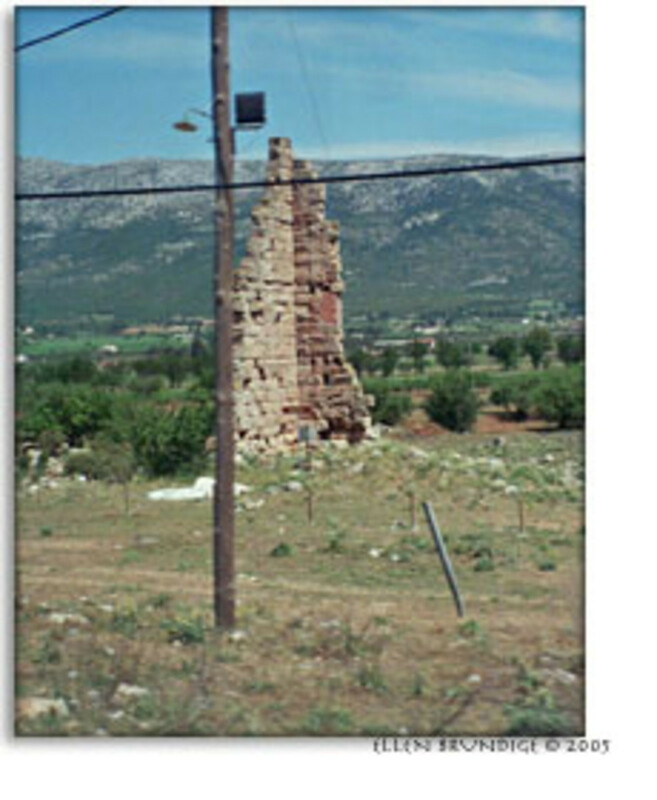 An hour or so later, we pass an all-too-ordinary town clustered over the ruins of the ancient acropolis of Thebes. Seven-gated Thebes! Let me remind you of her story. Here was the home of Oedipus, ill-fated king of myth, who tried so desperately to avoid his fate. His parents had him exposed on Mt. Kithairon after Delphi's oracle said he would kill his father. Well-meaning shepherds took pity on the baby and delivered him to the childless king and queen of Corinth. Delighted, they raised him as their own son. As a young man, however, he fled, after learning from another oracle that he was fated to kill his father and marry his mother. At a crossroads in the mountains, an old man in a chariot tried to run down a stranger he took for a peasant. In response, Oedipus defended himself from a man he thought a lout. He killed the man trying to run him over and continued on. In Thebes, Oedipus learned the city was being menaced by a man-eating monster, the Sphinx. He confronted and defeated her with his wits. The widowed queen gratefully married her city's savior. Years later, as dramatically retold in Sophocles' Oidipous Tyrannos, the king uncovered the terrible truth and blinded himself in shame. 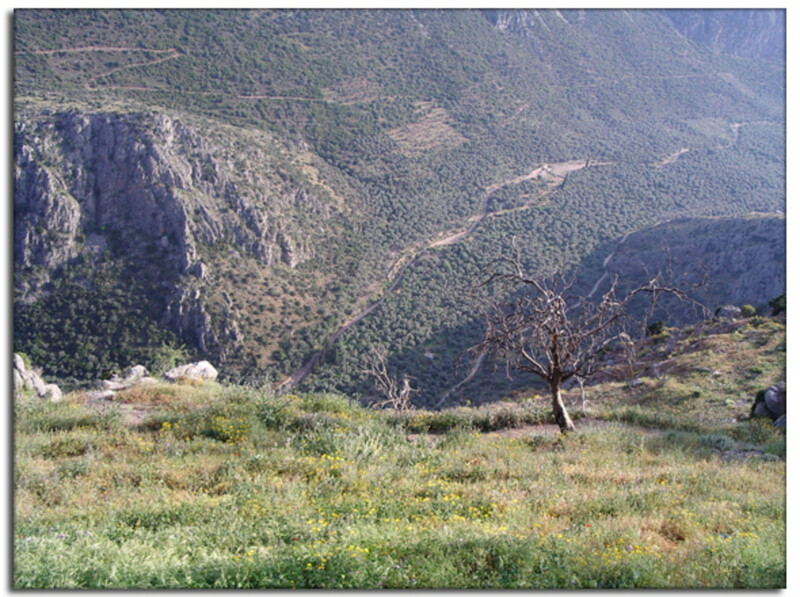 Our tour guide tells us this story as we ascend the heights of Mount Kithairon, still as wild and rocky as when infant Oedipus was brought there. Later, we pass Mount Helicon, home of Hesiod the poet and the nine Muses. 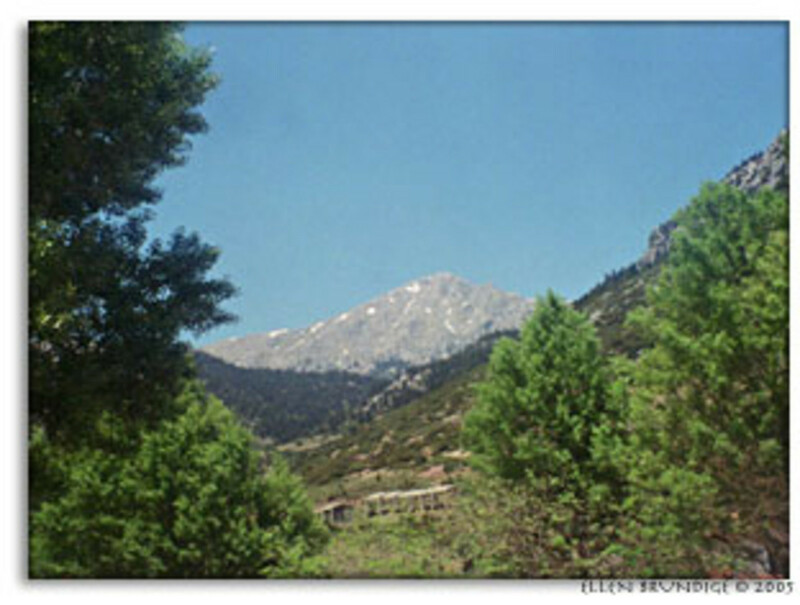 At last, we reach the foot of Mount Parnassos, its 8,000 foot heights still covered in snow (and ski resorts). We pause for lunch of stuffed grape leaves (too salty) and fried feta cheese (perfect). I try my first beer, lured by the brew's name -- Mythos -- and discover the moniker can't make up for the taste. We pile back into the bus and thread great looping switchbacks up the mountainside. Far below us is the very spot where Oedipus slew his father. The crossroads are still there. 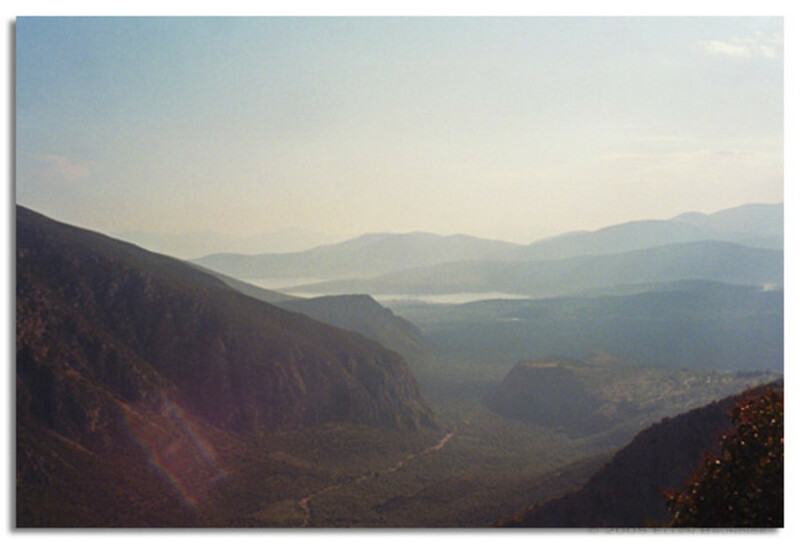 Mountains rise around us, blue in the haze, their sheer rock walls laced with waterfalls. At last, rounding the shoulder of mighty Parnassos, we see the ruins of a little round temple far below us on our left, which Anna our guide identifies as the Temple of Athena Pronaia. Just past it the road bends sharply to the left, following a fild in the mountainside. Facing us just beyond that turn, the sanctuary of Apollo mounts Parnassos' steep heights. We get our first glimpse of the ruined Temple of Apollo, its grayish-pink columns peeping through dark cypress. 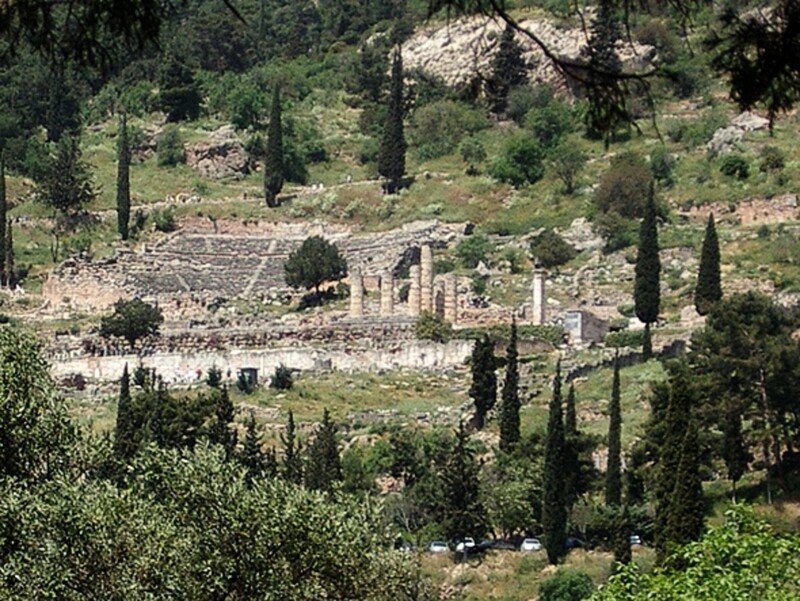 We pass the sanctuary and continue a mile or so around the mountain to the modern town of Delphi. Our destination is the Pythia Hotel. My roommate and I decant and backtrack along the high mountain road, gazing over the drop-off to a deep valley widening out into the distant Bay of Corinth. Long ago, chariot races were held down there as part of the Pythian Games. We reach the sanctuary. Seven Euros gain us entry. We ascend the ancient switchback road up to Apollo's temple. Stone retaining walls blend with the mountain's flesh, from which many of the small outbuildings are cut. Most are treasuries, small square buildings of cut stone erected by various city-states to house the offerings they or their citizens had dedicated to Apollo, both to win the god's favor and to serve as a patriotic advertisement to passersby. Visitors from all over the Greek-speaking world would see them. 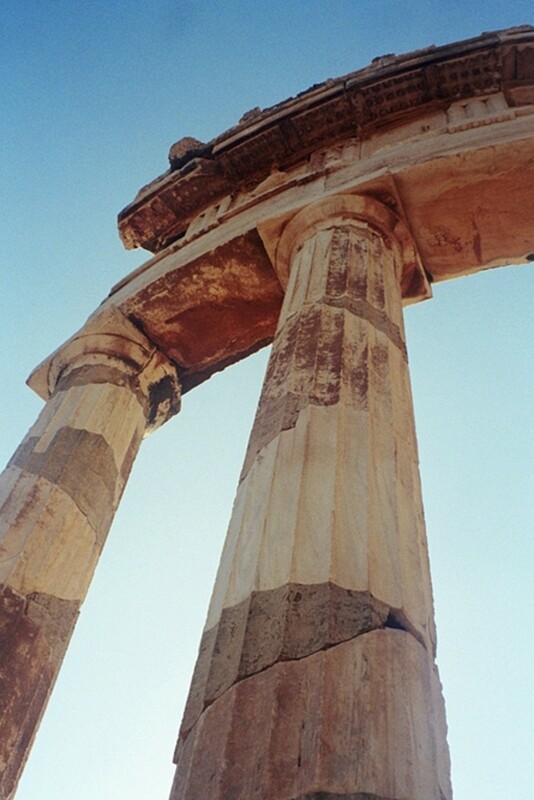 I notice and point out the different orders of Greek architecture: Doric, Ionic. A few structures perplex me: semicircular walls with inscriptions on them. Stone blocks sprawl everywhere, and the flagstones underfoot are as usual polished to a marble finish by centuries of traffic. The Treasury of the Athenians has been rebuilt, its stately Doric columns supporting friezes decorated with the exploits of Hercules and Theseus. Swallows nest there, other songbirds too. The mountain is alive with their singing and that of a few grasshoppers. 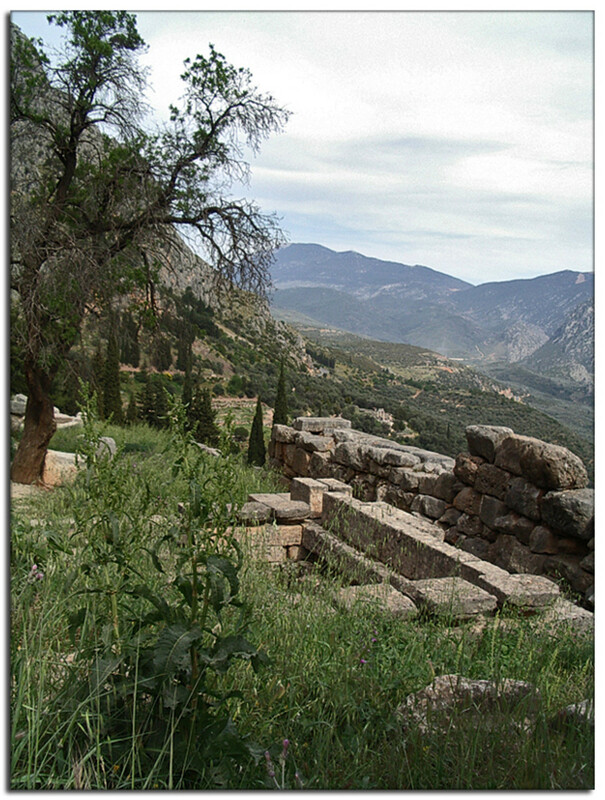 On a platform above these lesser buildings are the broad foundations of Delphi's Temple of Apollo. Most of it has fallen and been carted away. A handful of rugged and pitted columns rise up in silhouette against the mountain. Did Apollo sing here? Perhaps, but Gaia has it now. Flowers fill treasuries laid bare to the sky. Treasury of the Sikyonians; Mt. Parnassos at left. ruins of Temple of Athena Pronaia -- 3 columns far in the distance. Sanctuary of Apollo, with switchback Sacred Way climbing up to the temple (just a few columns standing) and theater on the slopes above it. Roman Agora on the lower levels of the Sacred Way. Columns of Temple of Apollo in the distance above. "Monument of the Epigoni" on opposite side of Sacred Way. Greekgeek standing in front of a Treasury. Treasury of the Athenians. 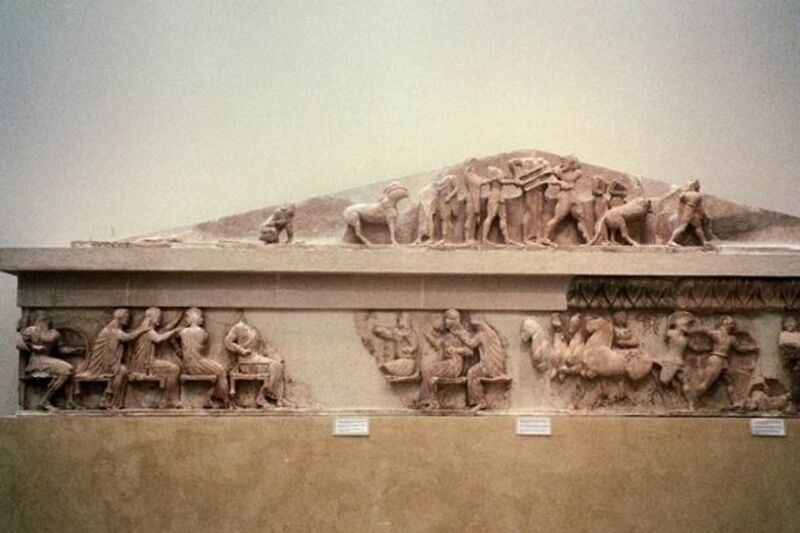 The relief sculptures at top are actually in museum; I'll show them later. The first switchback of the Sacred Way with Treasury of the Athenians in the distance, the Lesbian Wall at right. 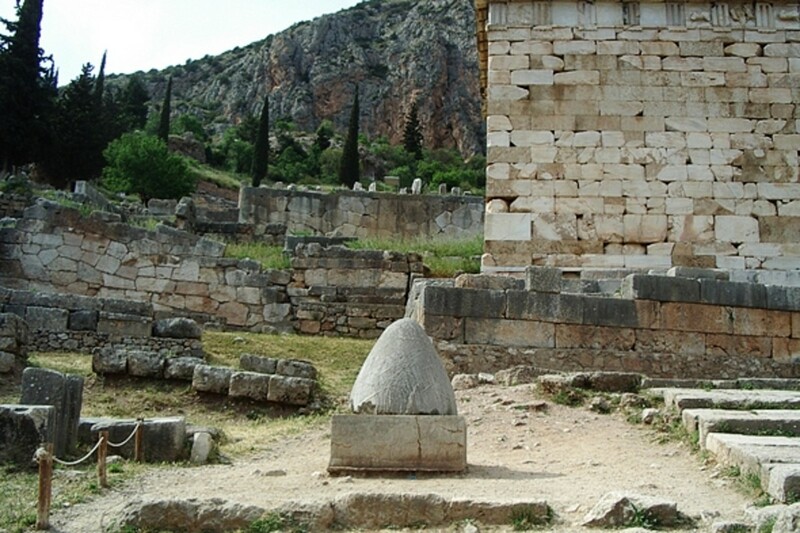 Omphalos of Delphi. This was supposed to be the naval of the world. The Delphic Oracle, the Pythia, would prophesy while touching it. Columns of the Temple of Apollo hewn from the limestone of Mt. Parnassos (behind it). Archaeologists put these back up. Between earthquakes and the softness of limestone, there's not much left except the under-structure. The theater in the foreground, the temple of Apollo on the next level down in the background, and in the wee distance is the Temple of Athena Pronaia on the slopes far below. 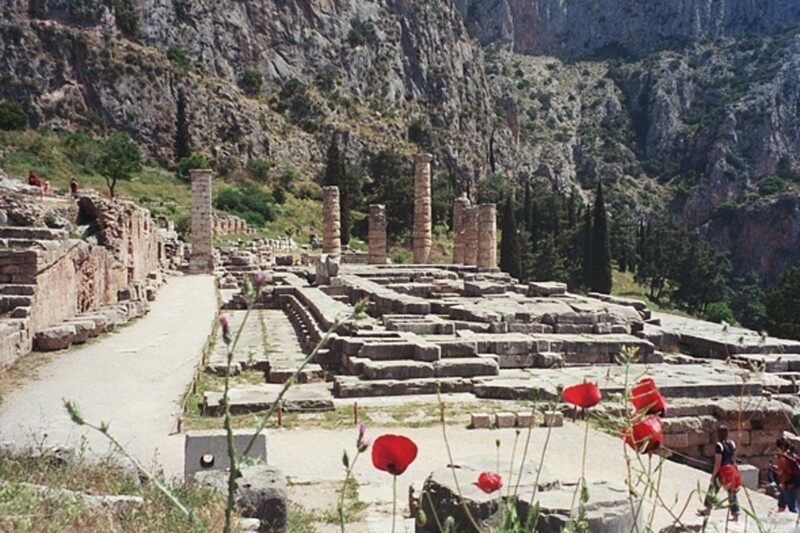 The foundations of the Temple of Apollo at Delphi, with ever-present poppies. We approached on the main road from the east (right side of this map), and the modern town is around the mountain just off the west edge (left) of this map. 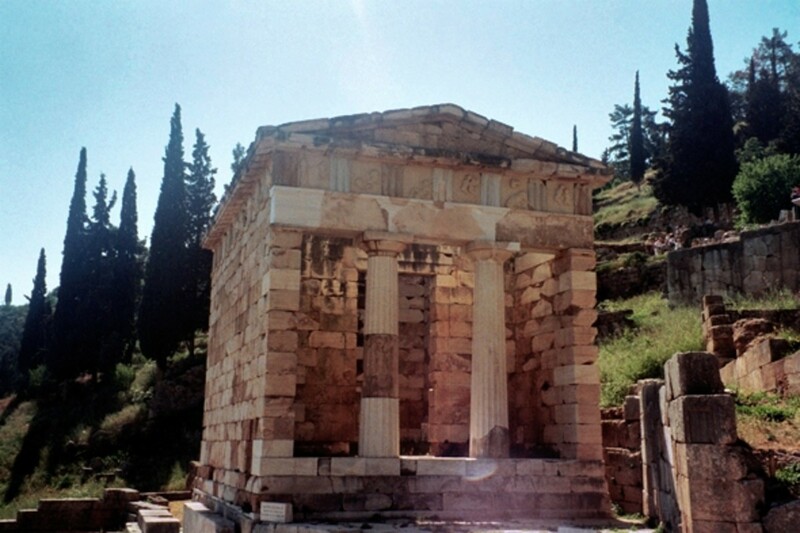 The little temple of Athena Pronaia is marked with "Tholos" near the lower righthand corner. Here's that overview map of my entire trip, so you can see where Delphi is in relation to Athens. Shyly I declaim a few lines of Homer in the steep little Greek theater. Then we descend to the level of the road and leave the sanctuary. A black cat shadows us along the way. Following the road and the old pilgrim's path in reverse, we come to the outflow of the Kastalian Spring, whose falls upslope are hidden by gnarled trees. Beside the modern road is an ancient walled enclosure with broken steps leading down to a pool where suppliants once bathed. 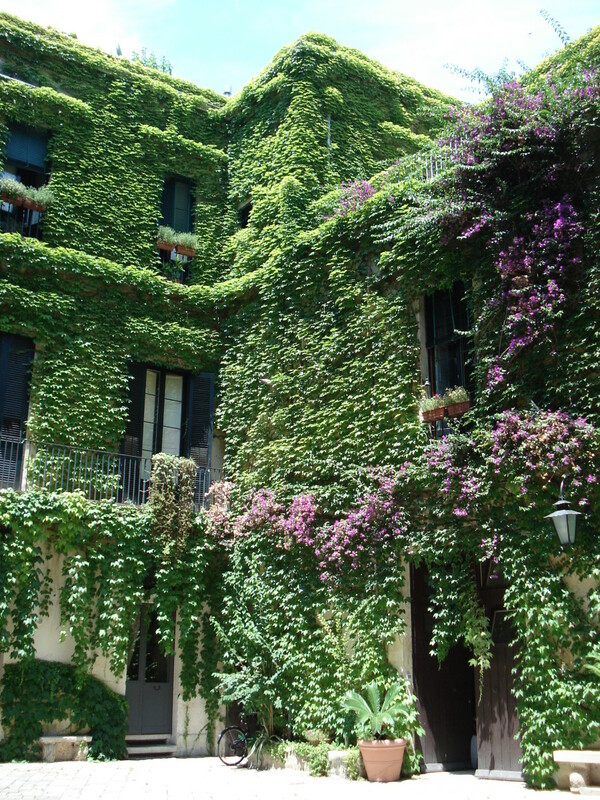 It is studded with purple flowers, and acacias grow over it, covered in ivy. Beside us, a moss-bedded stone channel in the rock bears a swift-flowing freshet down to the pool. I risk a drink and wash my face in the cold mountain water. Athena beckons us on. Farther along the road, on the opposite side from Apollo's sanctuary, we descend long dusty switchbacks in the afternoon sun. We soon wish were were back at the spring! We nearly give up, despite the ancient gray-green olives all around us promising that the goddess' sanctuary is near. An omen. My roommate hears a snake in the grass beside a short flight of steps we're descending. I think it's an animal-- surely it's too big for a snake! I hurry down to look and find she's right. For a moment an emerald green head as big as my hand is looking at me, then it dives for cover in the underbrush. My roommate throws gravel at it to chase it away. I am delighted: Python is still here after all. For there are archaic foundations in the vicinity, evidence of a goddess cult predating that of Apollo up above. Local legends hint that it was originally Gaia's, but in classical times it is a shrine to Athena, another goddess often depicted with a serpent companion. I enter the sanctuary singing my alma mater's Pallas Athena hymn under my breath. There are dark stone foundations of an older, rectangular temple. Beside it rise three columns of an unusual structure for the Greeks, a round building called a tholos. Usually this shape is reserved for the tombs of heroes. As an Athena shrine, it's unique. We pause here to rest, drinking in the ruins, the olives, peace, the mountain's timeless presence. Then we must hurry back in time for the evening lecture. The sanctuary of Athena Pronaia ("in front of the sanctuary") is on the slopes below the Sanctuary of Apollo. There's hints that Gaia was worshipped here before Apollo and Athena came on the scene. These dark blocks behind the Tholos are what's left of the actual Temple of Athena: the foundations are here; everything else is gone. This temple was built ca. 500 BCE. Whatever it is, the Tholos is very photogenic. I'm less photogenic, alas. Here's another view of the Kastalian Spring. There is great magic in meeting old friends diligently studied and learned in Archaeology 101 for the first time! The tour through the museum was quick, as was our sprint up the mountain to explore the sanctuary; I was very grateful for yesterday's ramble. We learned much from our guide Anna today. 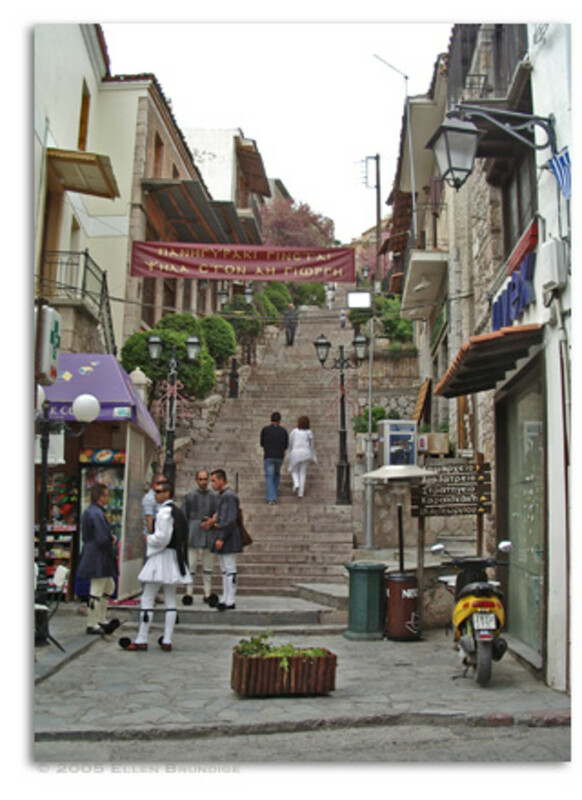 The Lesbian Wall (left, funded by the island of Lesbos) bears the emancipation proclamations of over 800 slaves, for Greek slaves, war captives, were often freed by their masters or given an allowance to purchase their freedom. The inscriptions served as an incontrovertible public record of the slave's status and now provide fascinating glimpses of their world; each one tells a life's story. We also heard about the Chians, who for obscure reasons were always allowed to cut in line at the highly-sought Oracle that was during most periods open only a few days a year. We paid respects to the large stone omphalos or naval, once considered the center of the known world, that the Oracle's priestess would touch while issuing prophecy. I picked up this excellent guide book at the museum and used it as a reference while writing this web page. 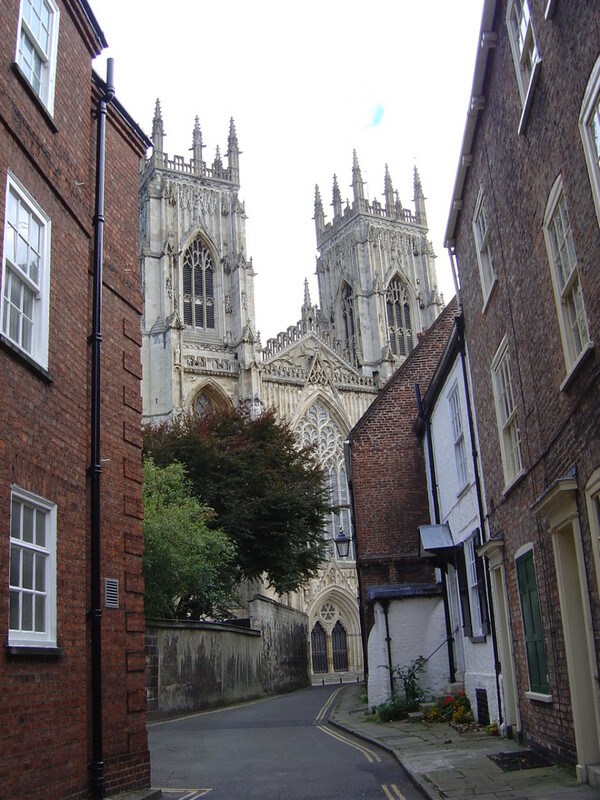 We hear of the recent discovery of faults beneath the temple, fitting the old myths of a crevasse in the earth. Scholars theorize that petrochemical gasses seeping up from below may have triggered the Pythia's trance. Anna tells us of famous oracles. The most well-known is that of King Croesus of Lydia, who consulted the Oracle concerning his military plans. Told "you will destroy a great empire" he launched his campaign, only to learn the "great empire" was his own. 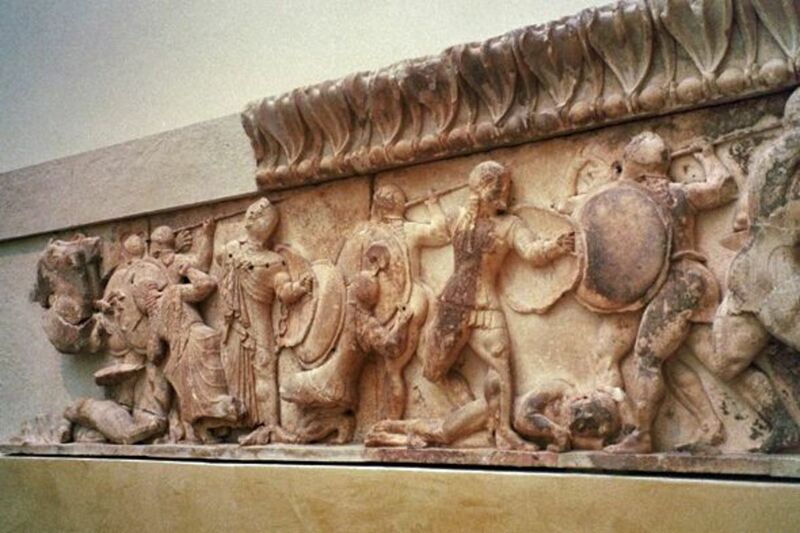 This tale is told by Herodotus, as is the famous "trust in the wooden wall" prophecy given to the Athenian general Themistocles during the Persian Wars. He persuaded his reluctant citizens that the wall named was not the city walls, and that they should abandon the city to be sacked, then strike back from the wooden walls of their ships. His insight proved true, and after the destruction wrought by the Persians, his successor Perikles instituted a rebuilding program that brought us the Parthenon and Erechtheion. Finally, Anna told how Alexander the Great dragged a Pythia from the temple whose exclamation, "you're undefeatable!" enhanced his fame. Above Apollo's temple lies the small rock-paved theater, unusual in that it has no backdrop -- what painted stage could match the breathtaking view? The path loops ever higher, until on a narrow shelf on the mountainside we come to a stadium. Here the Pythian Games were held every four years. In ancient times the Olympics were the greatest of four Panhellenic games that rotated between four sacred sanctuaries: Delphi, Olympia, Nemea where Hercules was said to have slain a great lion, and Isthmia, the Isthmus of Corinth which served as the meeting-point between north and south. Some ambitious members of my tour group run the length of the stadium and back, no small feat in the heat and high altitude. Despite the sunshine, I don't sense Apollo so much as Gaia, speaking through the profusion of poppies, wild geraniums, agave-like narthex spilling down the slopes, dark cypress above and gray olives below. Two brindled cats stalk butterflies among the rocks. 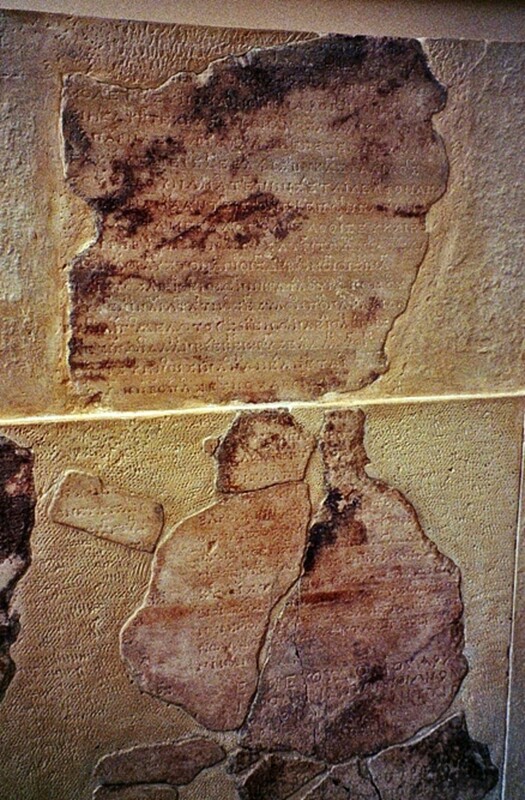 Petitioners to Delphi dedicated art: portraits of themselves, of loved ones or of the gods. There were also games held here like the Olympics. 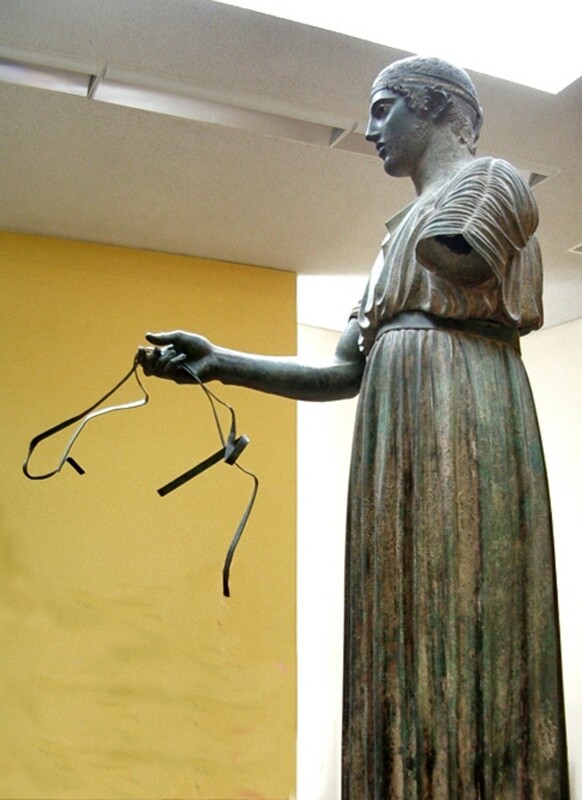 The bronze Delphi Charioteer is one of the most famous dedications. This wonderful bronze was dedicated in 474 BCE by Polyzalos of Sicily, who asked Apollo to bless him in its inscription. He was the owner a victorious chariot team in the Pythian Games. The style is Early Classical. 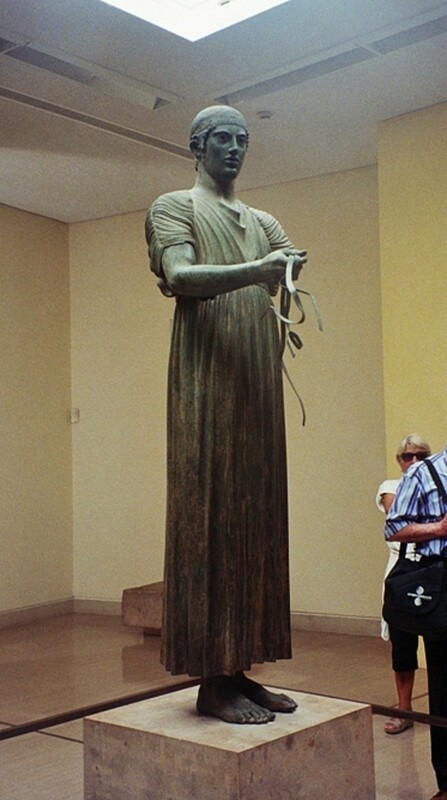 One more view of the Delphi Charioteer to give you a sense of its height. The legs are too long, because he originally stood in a full-sized replica chariot. A few fragments of the horses have been found. Chryselphantine (gold and ivory) statue of Artemis, Apollo's sister. think the head and arms would have been attached to a wooden manikin which was probably clothed. It was burned in a fire. 7th. century BCE, Archaic style. Matching gold and ivory statue of Apollo, again burned. He holds a shallow offering-cup. Biton, one of a pair of brothers -- see their story below. 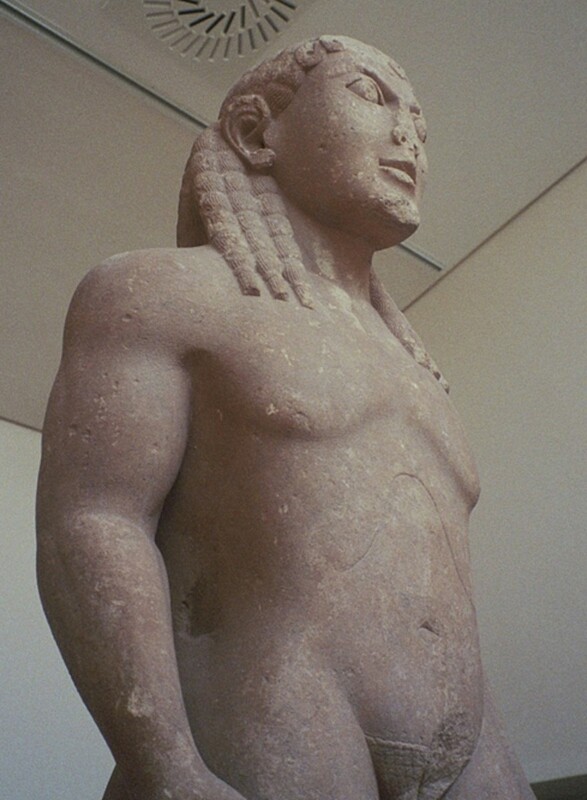 Archaic Greek art (another kouros figure), 610-580BCE. About 7 feet (2.15) meters tall. Another Antinoos, boyfriend of Emperor Hadrian. 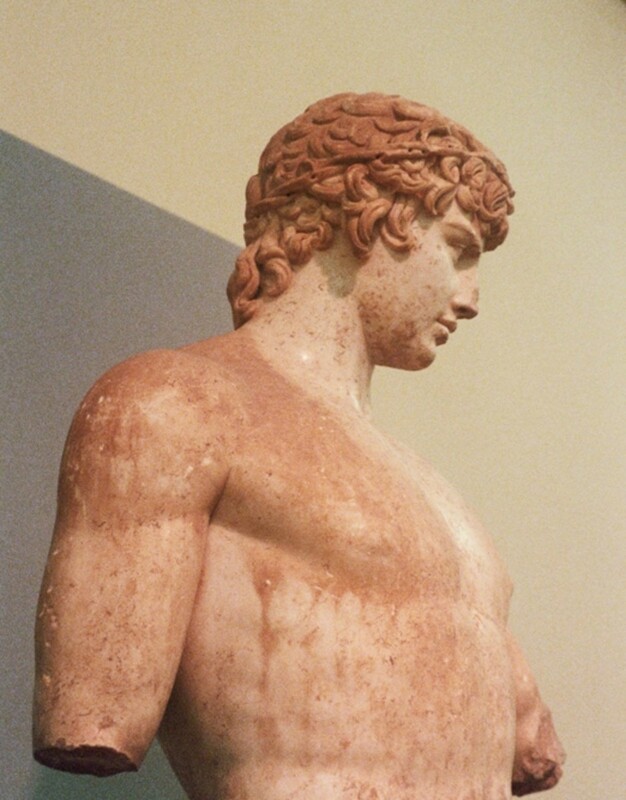 Roman period imitating classical Greek, but the proportions are post-classical. c. 130-138 BCE. 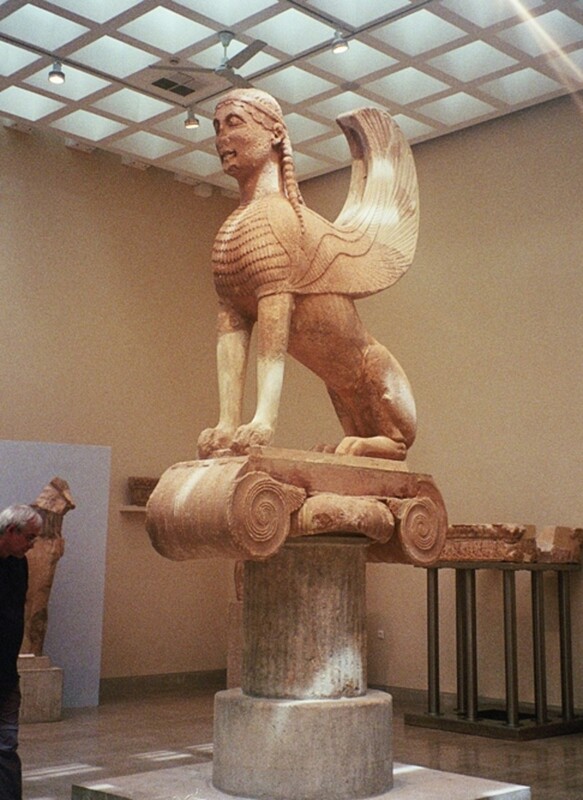 Imposing Archaic sphinx -- note visitor for size -- in the best archaic style, once topped a 33 foot (10 m) tall pillar at the entrance to the Sanctuary of Apollo. A gift from the island of Naxos, which I'll visit later. The sandals of Sisyphus, c. 335 BCE. One wealthy petitioner at Delphi commissioned statues of all his famous ancestors; Sisyphus was one. I've got a costumer's interest in ancient footwear. I think this is a kind of shoe called a krepis. One of my photos shows a Hymn to Apollo carved in stone. The notes were written above the words. Using the meter of the poetry, scholars have reconstructed the timing. Read a translation and listen to the song First Delphic Hymn to Apollo, music from 163 BC! The historian Herodotus told many stories about Croesus, famously rich king of Lydia. 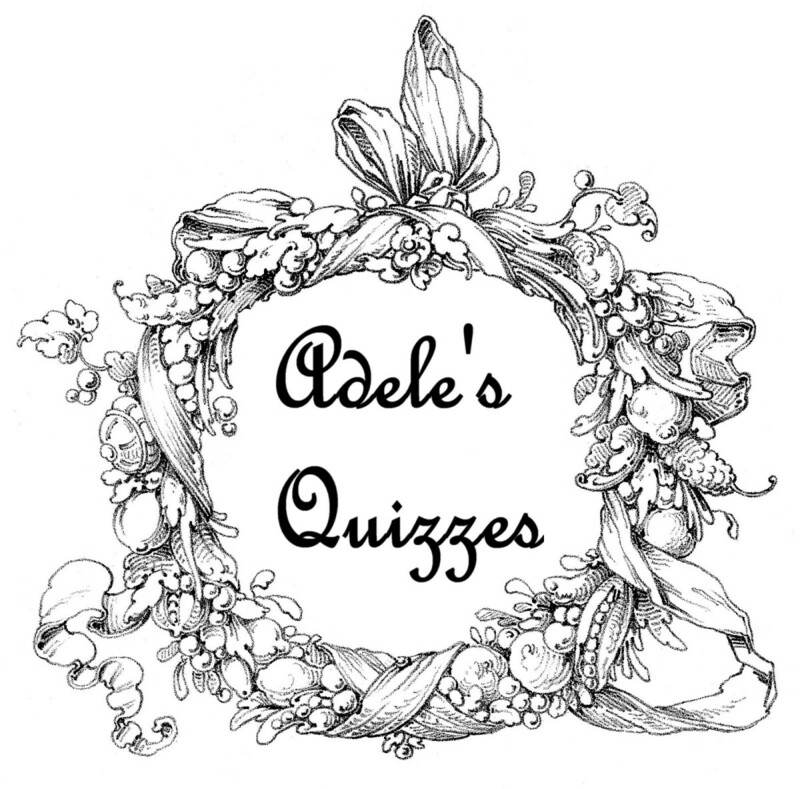 It was Croesus who demonstrated the ambiguity of oracles, forgetting to ask "whose?" when the Pythia said, "if you cross the river Halys, you will destroy a great empire." "Cleobis and Biton. They were of Argive stock, had enough to live on, and on top of this had great bodily strength. Both had won prizes in the athletic contests, and this story is told about them: there was a festival of Hera in Argos, and their mother absolutely had to be conveyed to the temple by a team of oxen. But their oxen had not come back from the fields in time, so the youths took the yoke upon their own shoulders under constraint of time. They drew the wagon, with their mother riding atop it, traveling five miles until they arrived at the temple. When they had done this and had been seen by the entire gathering, their lives came to an excellent end, and in their case the god made clear that for human beings it is a better thing to die than to live. The Argive men stood around the youths and congratulated them on their strength; the Argive women congratulated their mother for having borne such children. She was overjoyed at the feat and at the praise, so she stood before the image and prayed that the goddess might grant the best thing for man to her children Cleobis and Biton, who had given great honor to the goddess. After this prayer they sacrificed and feasted. The youths then lay down in the temple and went to sleep and never rose again; death held them there. 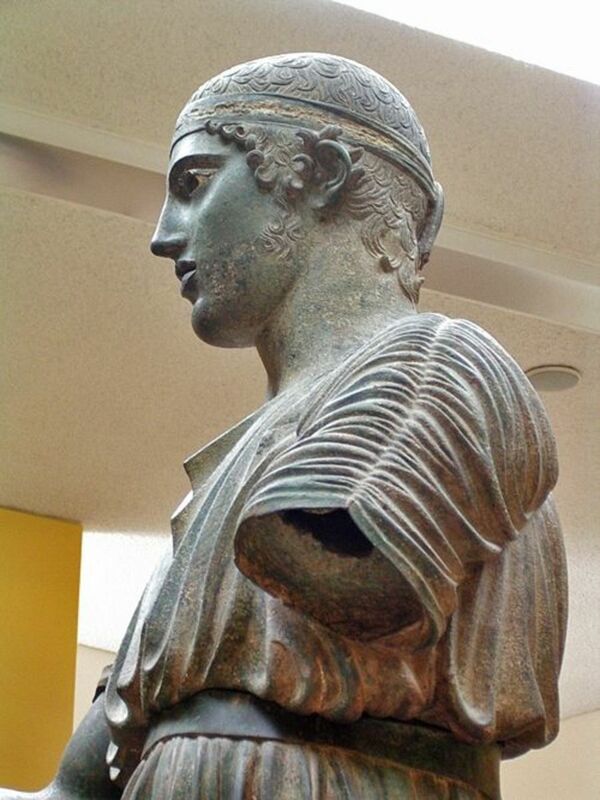 The Argives made and dedicated at Delphi statues of them as being the best of men." -- Herodotus Histories 1.31, trans. A.D. Godley, from the Perseus Digital Library. Solon then told Croesus he would count no man happy before his death. Croesus failed to get the point. Soon after he mistook the oracle from Delphi concerning his planned invasion into Persia. He crossed the river Halys, lost the war, and was taken captive. During his execution, Croesus cried out Solon's name, finally understanding the fable of Kleobis and Biton. King Cyrus of Persia demanded an explanation. He was so moved by the tale that he spared Croesus' life. Apollo Cup, 480-470 BCE. White-ground pottery. The god has his turtleshell lyre and is pouring an offering to himself. A raven or crow -- both associated with him because of their intelligence -- looks on. 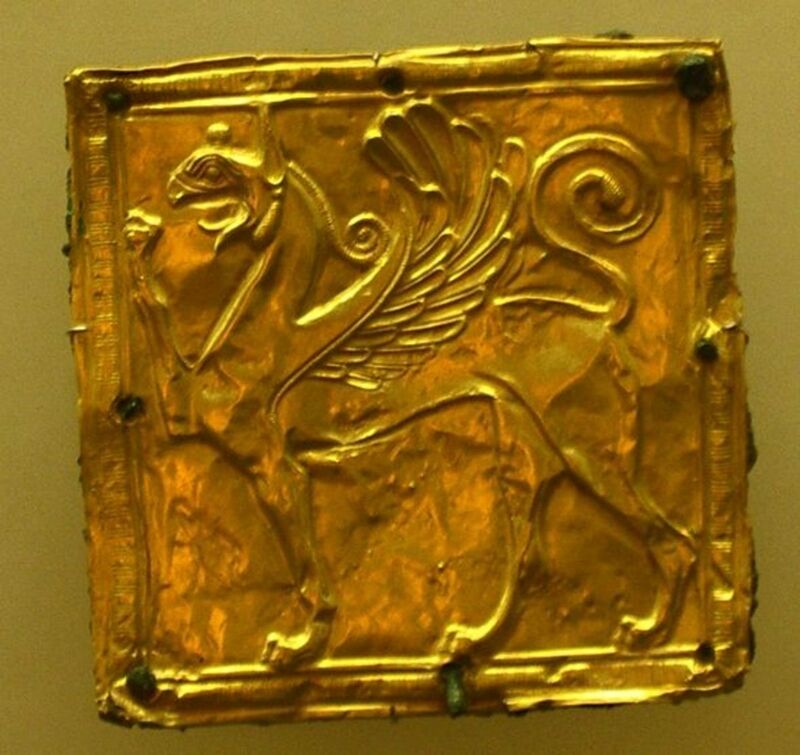 Found in the same rubbish heap as the gold and ivory Apollo and Artemis, this hammered gold griffin probably adorned a belt or clothes of the statue of a god. 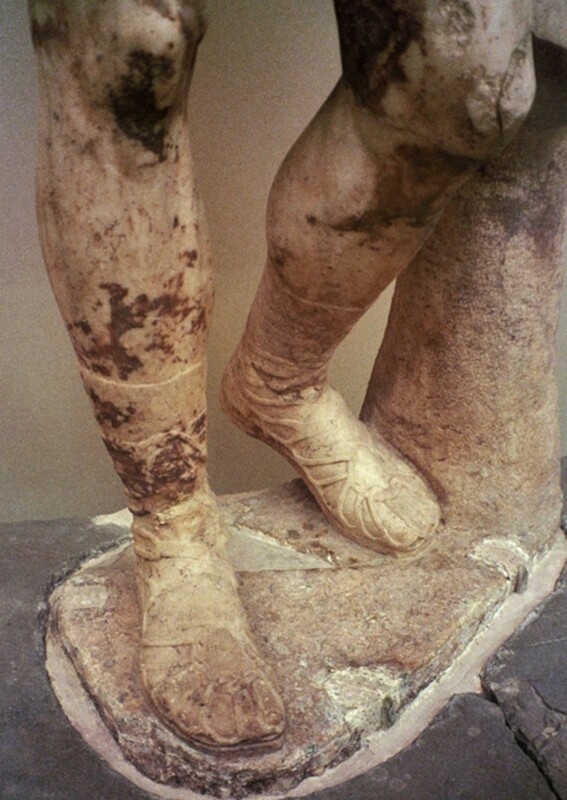 These damaged discards came from eastern cities-- some probably came from King Croesus! 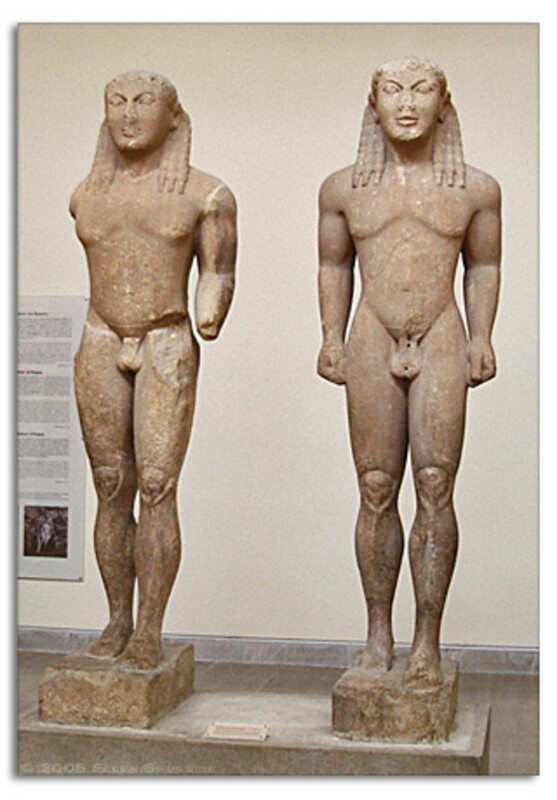 8th-7th century BCE archaic period. 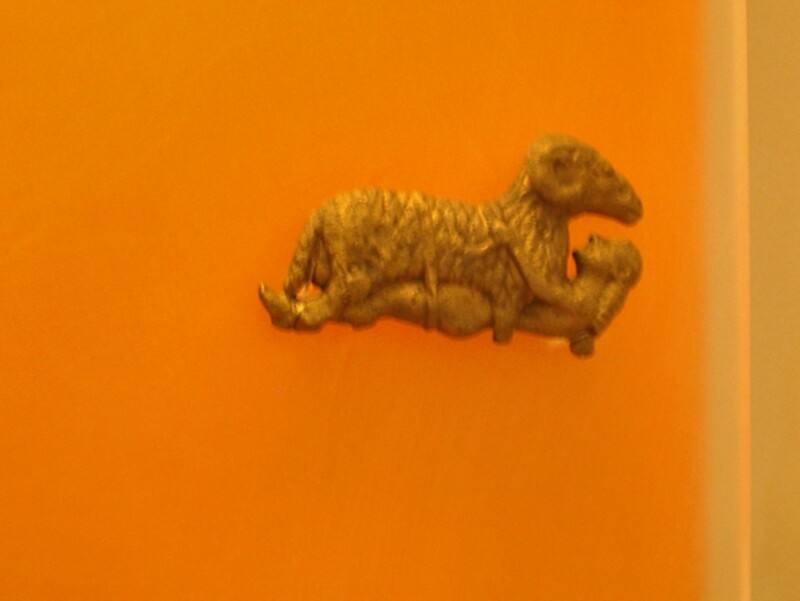 Teeny gold jewelry representing the story of Odysseus escaping the cave of the Cyclops by smuggling his men out clinging beneath the monster's sheep. 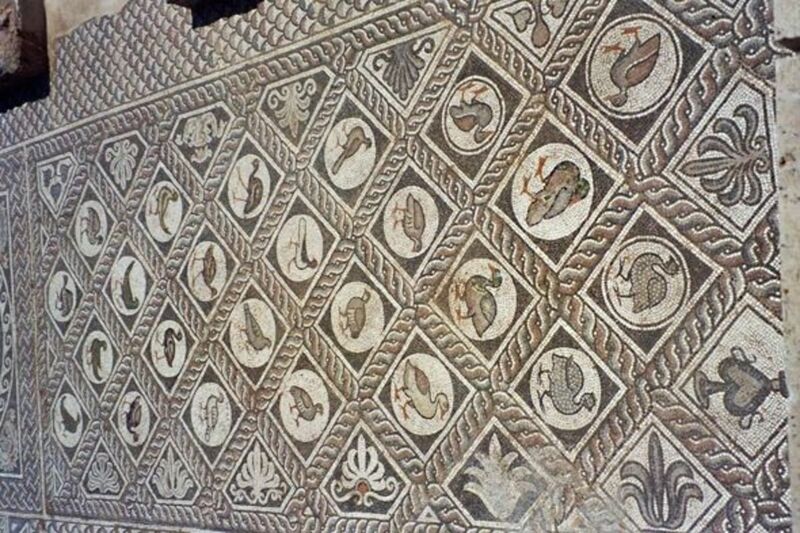 Jumping far ahead, this 5th century CE mosaic on the floor of a Christian church shows the tradition of old Roman mosaics: exotic animals of all sorts decorate the spaces, with a few human figures thrown in. 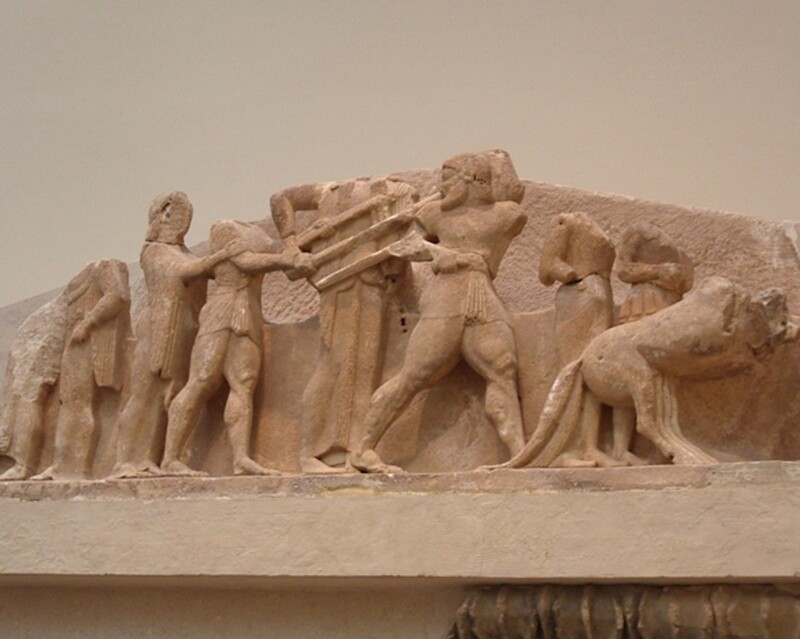 More of the North Frieze of the Siphnian Treasury. 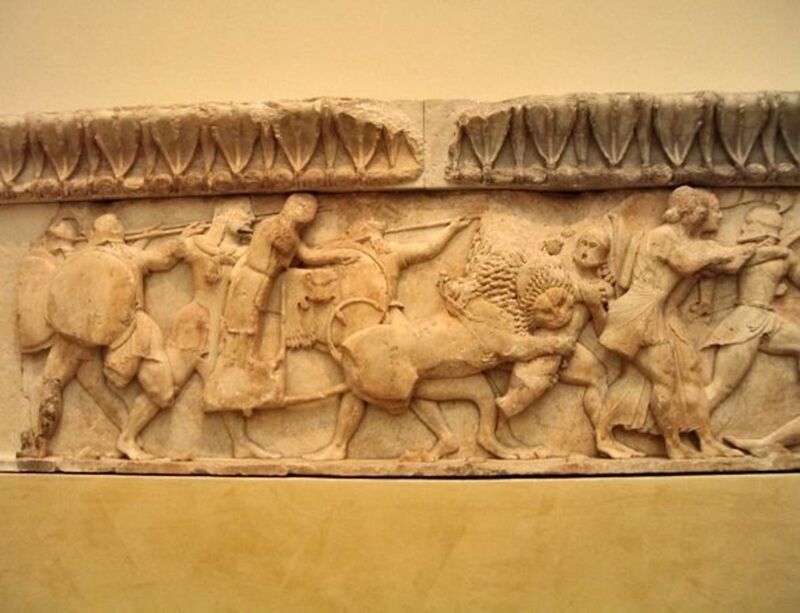 The goddess Cybele attacks from a chariot drawn by lions! Artemis and Apollo are in front of her. 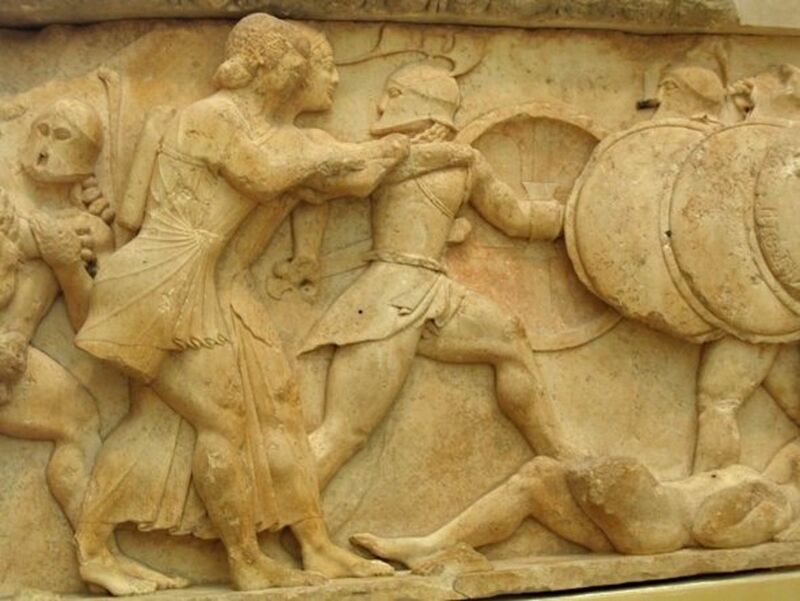 Siphnian Treasury, close-up of Apollo (short tunic) and his twin sister Artemis (longer gown) taking on the Giants. 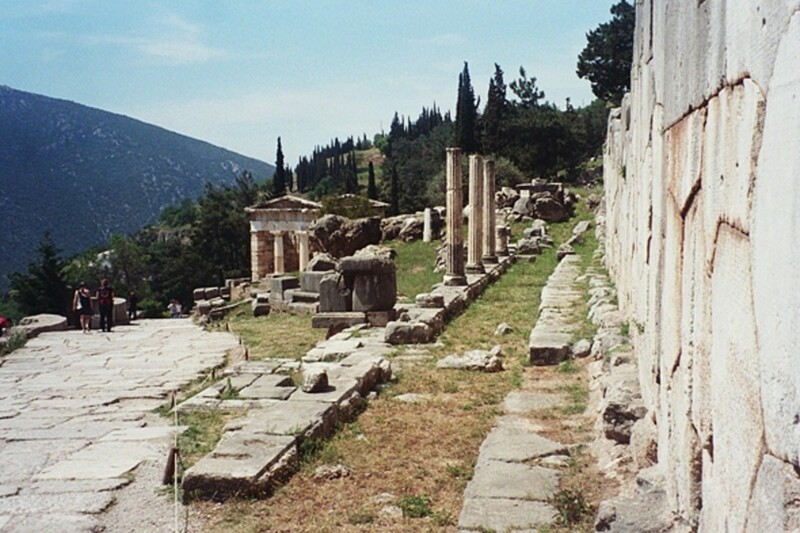 History and Mythology of Delphi, including an excellent timeline. Neat little tour of the archaeological site with a simple map and a brief history. 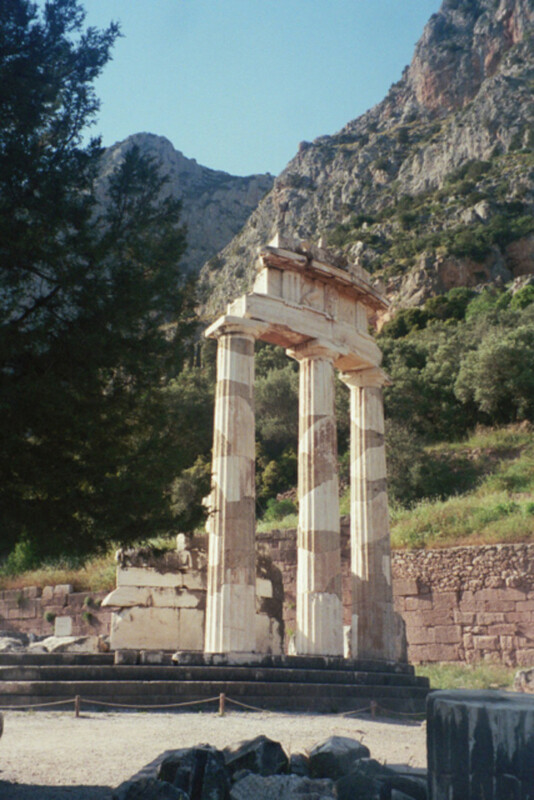 A good personal webpage on the sanctuary and temple of Apollo at Delphi, retracing step-by-step the route up the mountainside with a few good photos. Part of an excellent site on the history, art and culture of Archaic Period Greece, this page explains how and when the Greeks consulted the Delphic Oracle, and how the oracle influenced Greek society and politics. 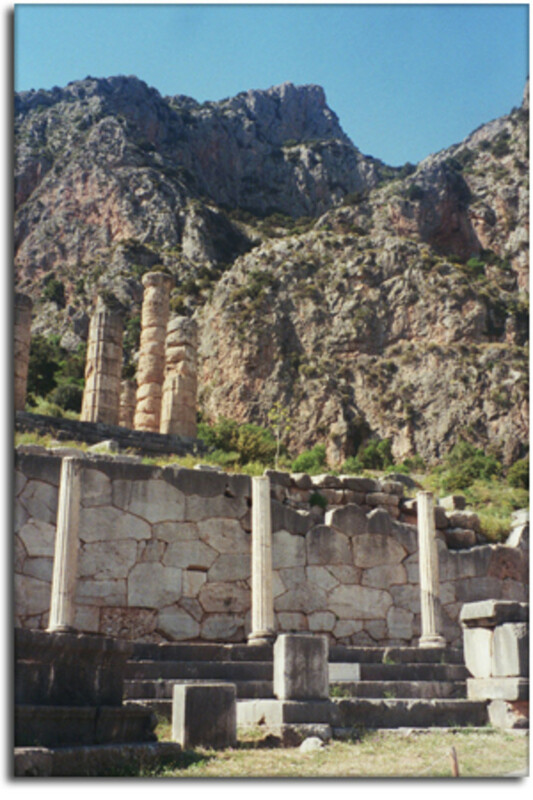 The official website for the site and museum of Delphi. Good photographs and detailed information. 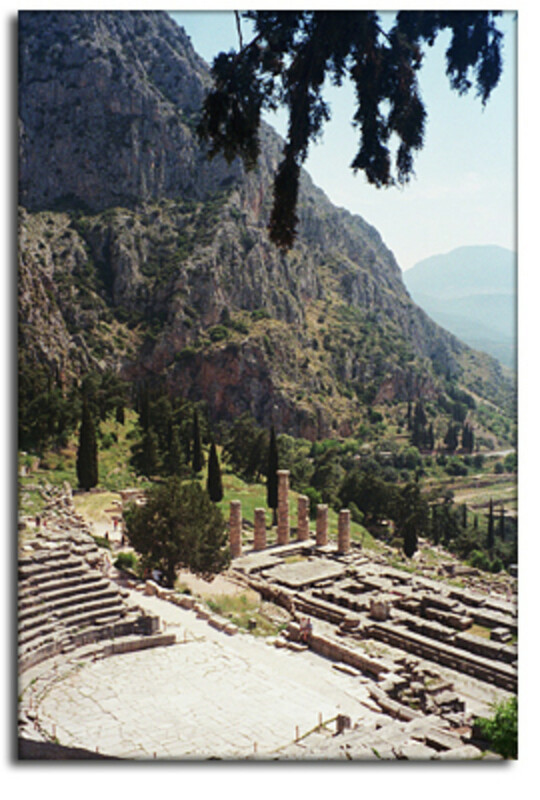 Sacred Destinations has good descriptions and photos of some of the best objects in the Delphi Museum-- photos I wish I'd taken! Also visitor information for Delphi Museum. Excellent article on Delphi reporting almost every recorded prophesy and the story behind it, using translated primary sources. Detailed archaelogical info and an extensive library of photographs, including aerial views. 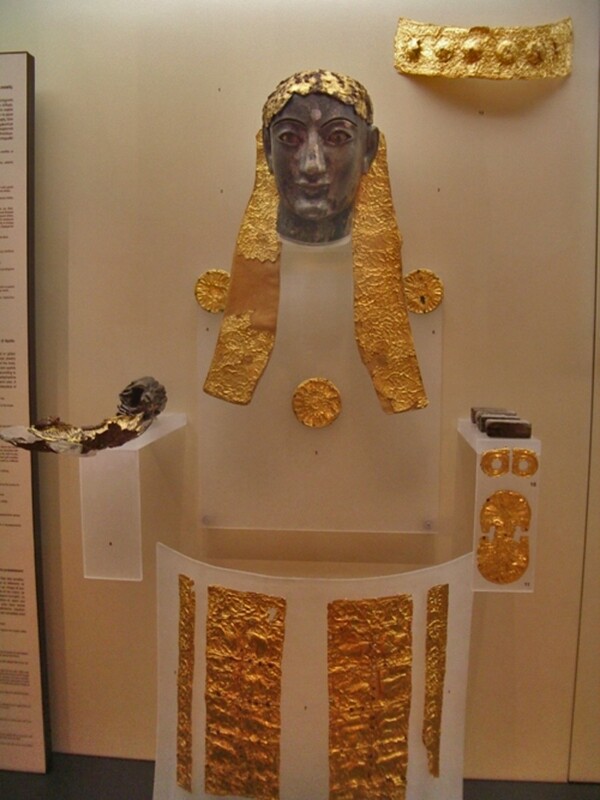 In-depth write-ups on major finds in the Delphi Museum, including the Siphnian Treasiury. Our group retraced our steps down the zigzag Sacred Way, past the Temple of Apollo and down to the modern road hugging the mountain. In the heat of the day we plunged arms and faces gratefully into the cold waters of the Kastalian Spring. I had emptied out a small water bottle the night before, and now refilled it. Retracing the route I had taken the day before, we headed down to the precinct of Athena. 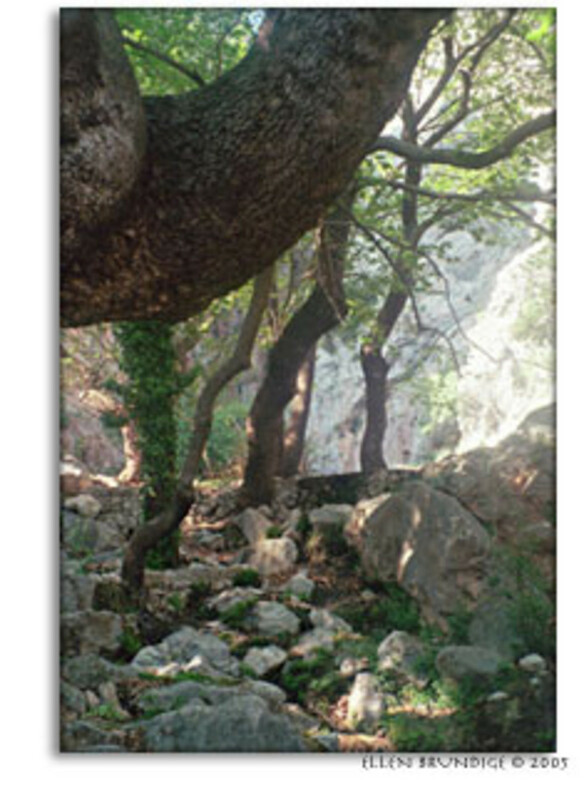 In Mycenaean times Gaia was worshipped here. The contrast between ancient chiselled marble blocks and green growing life in that quiet place seemed to suit the earth goddess. The rest of the group headed off to lunch in a nearby town, but I'm never satisfied with the modern world when the ancient beckons. The museum closed at three. So I returned with one couple and gave them the best guided tour I could manage, lavishing love on familiar old sculptures and helping them pick out mythological scenes. "Ah, here's Hercules killing the lion!" and "here's Theseus offing some robber he met on the road to Athens," and "hey, look at this tiny Odysseus clinging to a sheep." Afterwards we took a taxi to the next town and had a late lunch of fried feta cheese(!) in a lovely rooftop cafe overlooking the valley, Greek music playing. I snapped a few photos of the stone village with its stairs, cheese shops. On the way back we passed Chris Downing out for an afternoon hike halfway up the mountainside-- indomitable woman! Determined to soak up as much as possible, I had the taxi drop me off a third time at the site, climbed the Sacred Way to the temple of Apollo one more time, and met my roommate for dinner. She discovered why one cannot order "Arabic Coffee" in Greece -- a highly offended (and probably teasing) shopkeeper insisted that it is Byzantine coffee, a Greek invention! We watched a deep blue sunset over the dusky mountains and the Bay of Corinth. The restaurant owner surprised us by insisting that we could not leave Greece without taking some music with us, and he burned two CDs for us from one of his favorite singers. I wish I knew the name! Finally we returned to the hotel and our evening lecture. 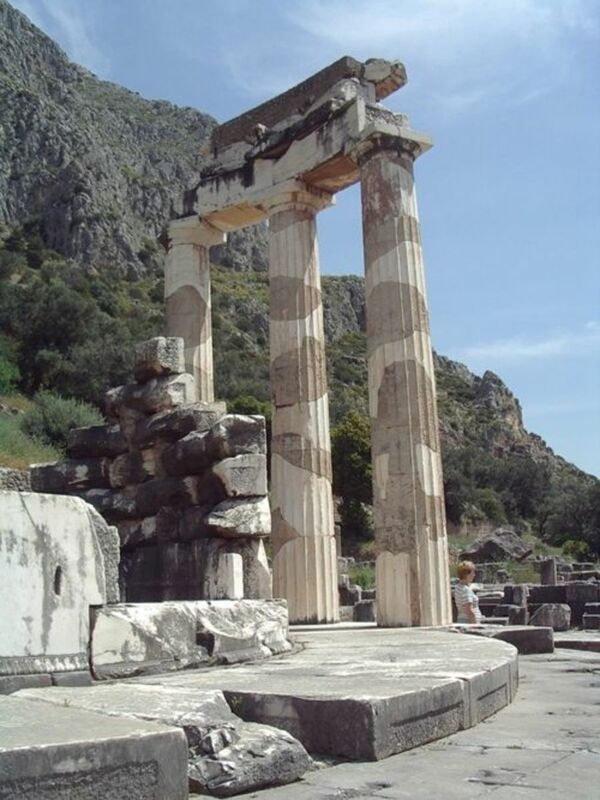 "Know Thyself" was inscribed over the entrance to the famous temple at Delphi. According to Dr. Christine Downing, this is not a call to Jungian self-analysis, but a reminder that we are mortal. Delphi's god is Apollo, Pythian Apollo, "Apollo who shoots from afar" or "the god that comes from afar." He is not really the sun god -- that's Helios -- although in later times the distinction between them became blurred. Rather, he is the god of "clarity, consciousness, clear boundaries, distinguishing things, and day." Temples to Apollo arise on sites once sacred to Gaia, Mother Earth. These are human-built structures in wild, lonely, harsh landscapes. 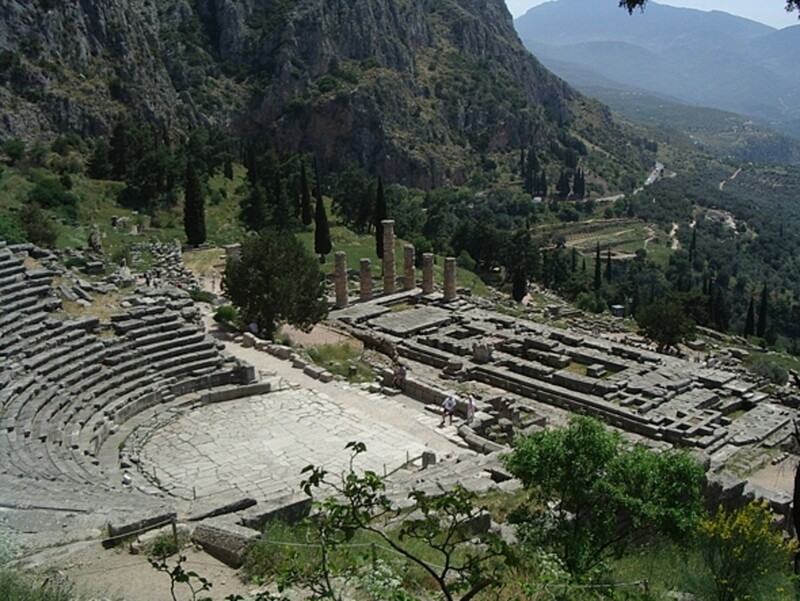 According to local legend, there was originally no oracle at Delphi, only the Python, Gaia's great serpent. Apollo slew it to establish his authority over the area and installed the Pythia, the maiden who delivered his prophecies at the temple, seated on a bronze tripod over a crack in the earth whence mystical fumes emerge. Other traditions say that the oracle had first been Gaia's, usurped by Apollo after killing its serpent guardian. Gaia tried to undermine his oracular monopoly by sending prophetic dreams to the locals, but Zeus put a stop to that after protests from Apollo. In Homeric and early myths, oracles (predictions of the future) come to people directly from the gods, unasked for, through dreams or signs. In the historic period, oracles are the priest/priestesses to whom the god sends divine inspiration. "Oracle" is also sometimes extended to the temple where the seer resides. Historical records show that the questions put to the oracle at Delphi were straightforward: "Would it be okay for us to start a colony at X, make war on Y, or build temple Z?" In dramatizations of myths, Delphi's ambiguous responses often advance the plot, as when Oedipus sends to Delphi asking how to avert his city's plague and receives a riddle that proves his undoing. 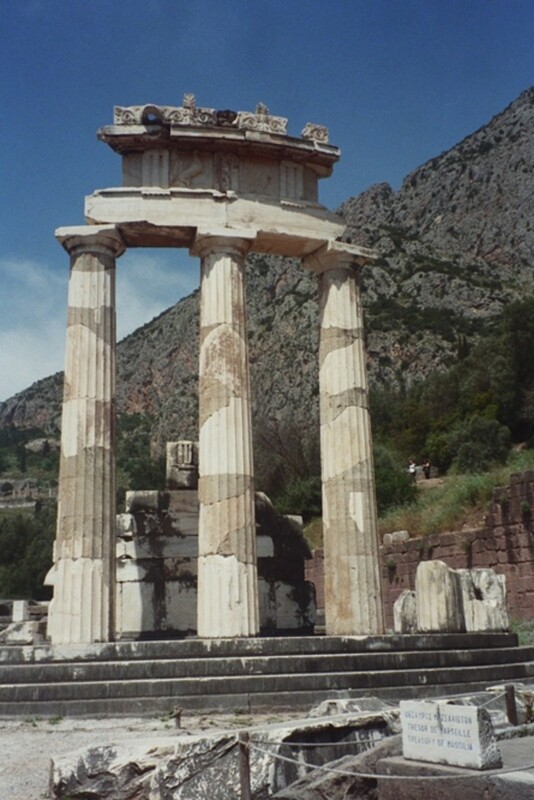 Delphi's oracle was the most famous and most prestigious of all oracles in the ancient world, and suppliants came from all over to consult its priestesses, the Pythias. Excerpt from Brookes More's lyrical translation of Ovid Metamorphoses on the Theoi Project's website. Excerpt from Brookes More's translation of Ovid's Metamorphoses Book 10. Another myth of a lover of Apollo, recounted in Metamorphoses 10. Theoi Project's entry on Koronis. Scroll down a bit for Pindar's version of the myth, or Ovid's longer account near bottom of page. 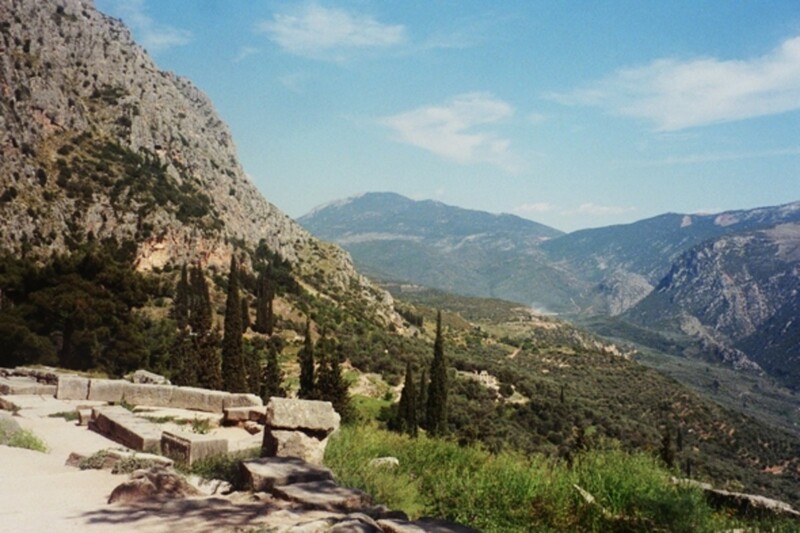 Alternate origins for the Kastalian Spring at Delphi. 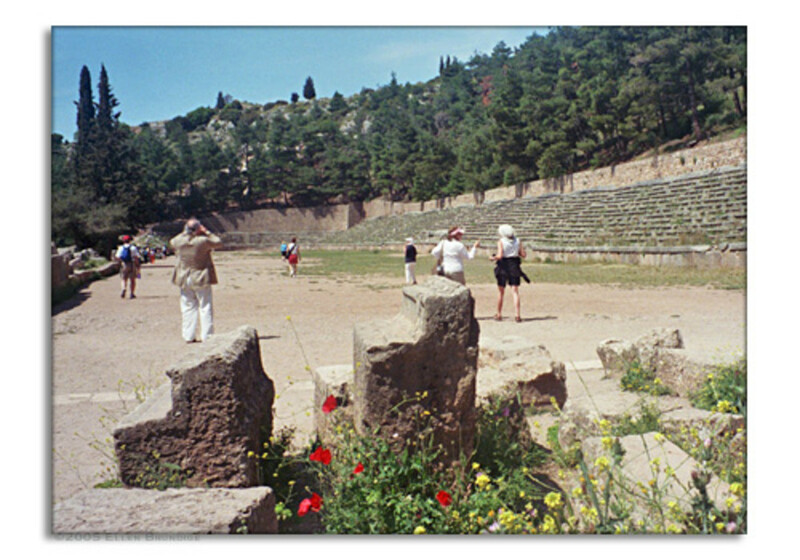 Join me in Ancient Greece Odyssey: Part V, where I visit Mycenae, home of Agammemnon! Phenomenal lens! 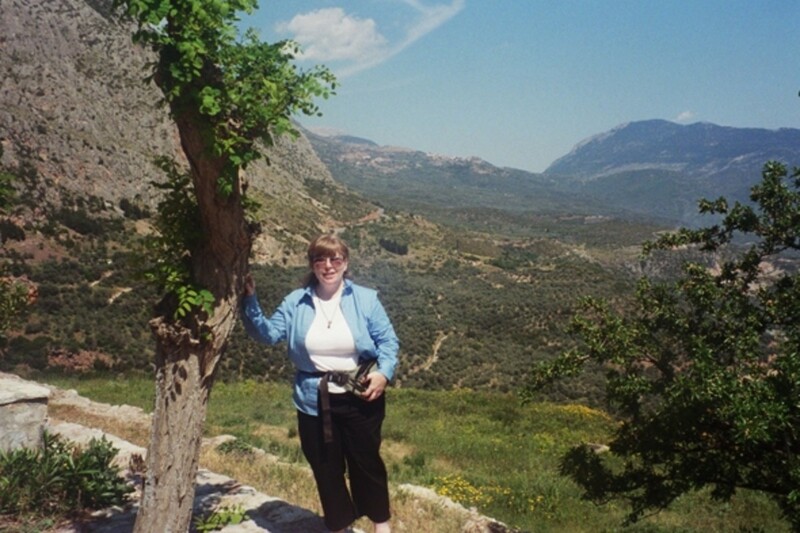 I was fortunate to travel to Delphi when I was in high school and I found it to be such a magical place - it was so exciting to imagine the ancient Greeks traveling to Delphi to see the oracle. I enjoyed reading this lens. Well done. 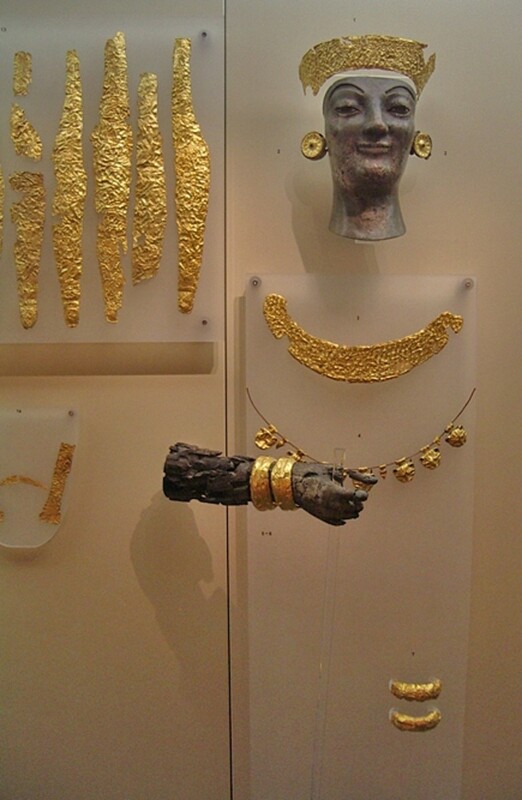 Delphi - the Belly Button of the ancient world. I was there in the early 1970s and it left a lasting impression on me. You are the first person that I would like to read my lens on the Greek debt. Thanks for sharing. I wish I could be there some time. I'm a little surprised that the museum 'piece' of this journey has a purple star and this one doesn't. It seems just as informative and well put together. 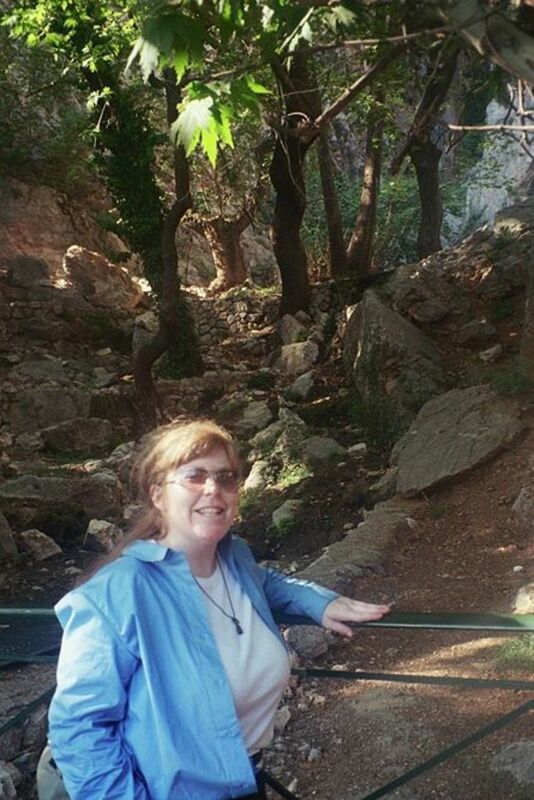 When I was at Delphi I collected some water from the fountain and sealed it in a small glass container. That means I will go back. I hope so. 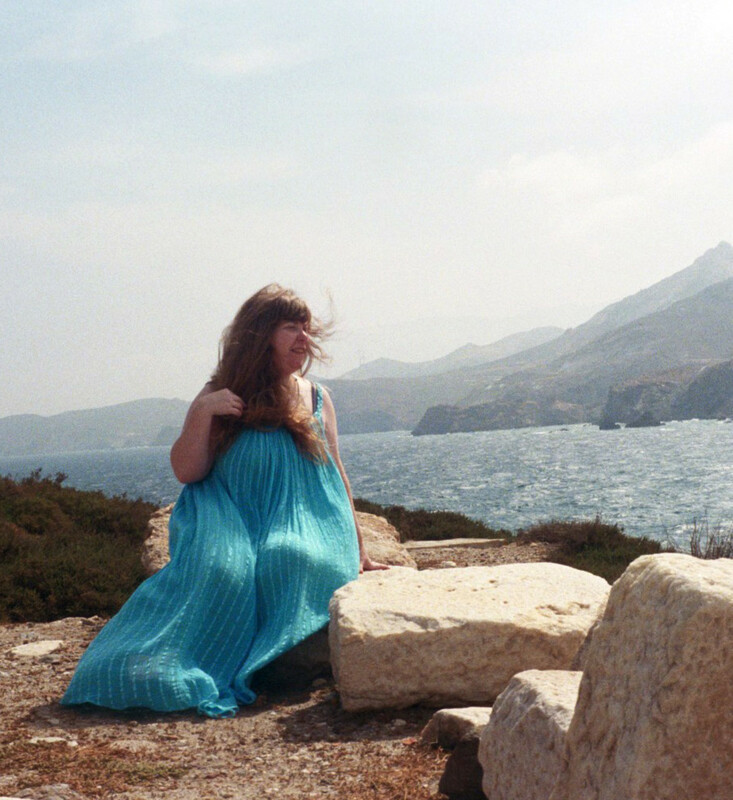 What an awesome trip to Greece, and very well documented to. Thanks for taking the time to share this with us! I am really enjoying this series of lenses with my son who is studying Ancient Greece. It gives us a great perspective up-close to the places we are reading about. Thanks so much for building these lenses. Fabulous lens! - and fascinating too. I am adding it to my lensroll of Cloak of Conscience. 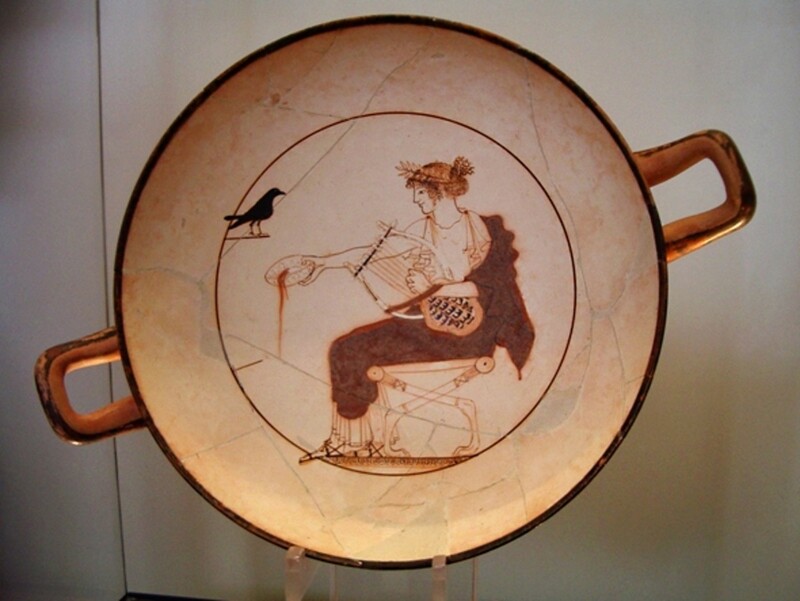 Isn't it amazing how beautiful the art was in Ancient Greece? 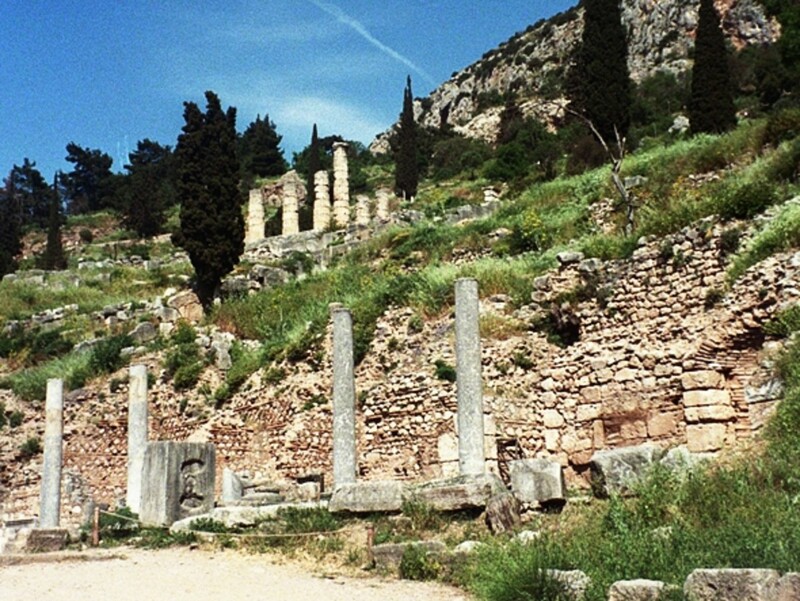 What an elaborated lens about Delphi Greece, The main attraction over here is Apollo temple, who ruins in the 4th Century BC. The current temple was built in at least 6th Century BC. Which is having an amusing story. it may be myth but I do believe in all these stories, and why not there are many unanswered questions on this earth. Oh me, oh my! I am just getting oh so excited about our upcoming vacation in November to Greece! Hubby mentioned that I might want to "get in shape" for all the walking. Hmmm! Oh, and by the way, your Lenses documenting you're trip are beautifully organized!